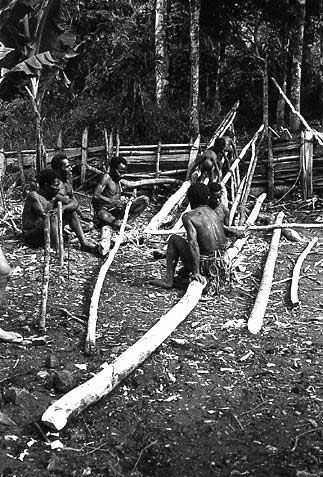 After the decision was taken that we would settle with the Vaydas among the Fungai people, the problem of where we would live arose. Although Peter and some of local men thought that we could go on living in the cargo house, we pointed out that it was very small and its roof was leaking badly. It was then decided that a new house would be built for us. Several sites were proposed. 007-02: Kapar watches Mar and Rorum beginning to level the site for our house. Para plays with a camp stool. By 9:30 a.m. on Wednesday, March 20th, Peter, Gul, and Pfun decided that our house should be built over the communual earth oven. The idea of using this site was discarded after Allison pointed out that it would take away the men's main sitting area. The deliberations went on for another hour and fifteen minutes. At that point, Kapar, one of the Vaydas' translators from Gai, sensed that the moment was ripe to turn words into actions, thereby forcing a decision. He took a small shovel from the haus kuk, and started leveling the ground at the eastern edge of the yard. He was soon joined by Gul and other local men. Next morning, Gul went off to collect building materials from the forest. 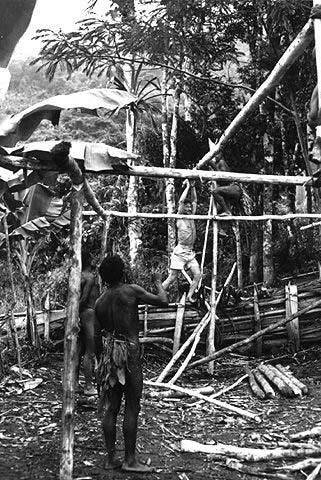 Many other Fungai men, as well as men of neighboring clans, the Korama, the Bomagai, and the Angoian began to bring materials and gathered in Gunts Yard to help with the construction of the house. They had already built a house for Peter and Cherry, so they had some idea of the differences between Maring houses and "European" houses. We "Europeans" needed more room inside our houses, so we could store the trade goods and the equipment which we had brought with us for our work. We had also brought in extra food (fish and meat in tins, rice, ovaltine, powdered milk, etc.) to supplement the locally available food. In addition, we wanted a house in which we could stand up. In those days, Maring houses were low to the ground, so a small fire built in the middle would keep people warm through the night. Dinige, Kabi and Kabang had settled down to skin the bark off the poles which they had brought in. 008-14: Gul cautions Marek and Ambia as they lift the ridge pole into place. In the afternoon, the corner poles were sunk in the ground; however, they seemed far too short to us. When we pointed it out, we were told that if the house were built as high as we wanted, the thatch would blow away in the next storm. A controversy developed. Allison went off to take a shower. When she returned, she was greeted by a scene of merry laughter: the short poles had been replaced with longer ones and everyone was in a good humor again. Gul returned with a bundle of miom leaves. He saw the height of the poles and declared that there wouldn't be enough material to cover the walls of such a big house. More discussion followed. Finally, a decision was reached to supplement the miom leaves with some of the sisalkraft which we had brought in. Gul then joined Marek and the others in putting up the beams. When Marek had been a boy he worked as a lumberjack in the woods far to the north of the European part of the Soviet Union. It was then that he had learned to use an axe. But the Maring men were worried that he would hurt himself. 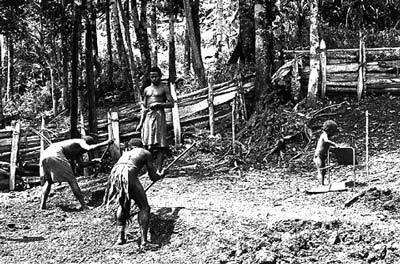 We were surprised at their concern, for they let their own children handle bushknives from a very early age: playing with tools was simply part of their learning about the world through direct experience. 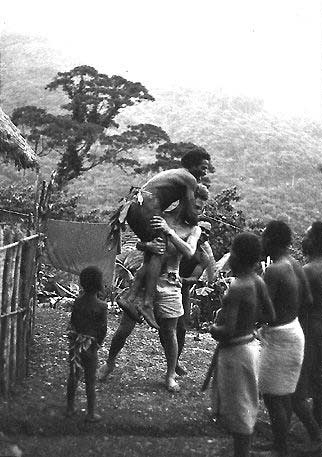 It only slowly occurred to us that the Maring had no idea that white men were capable of handling such tools: they had never before seen a white man doing heavy physical work. By the time darkness was falling, the framework of the house was finished. Marek and Gul were pleased with the result. In a moment of celebration Gul picked up Marek. Then Marek picked up Gul. 008-17: Gul, Marek and the work boys celebrate the day's work.